Those chest tubes have really made a difference. 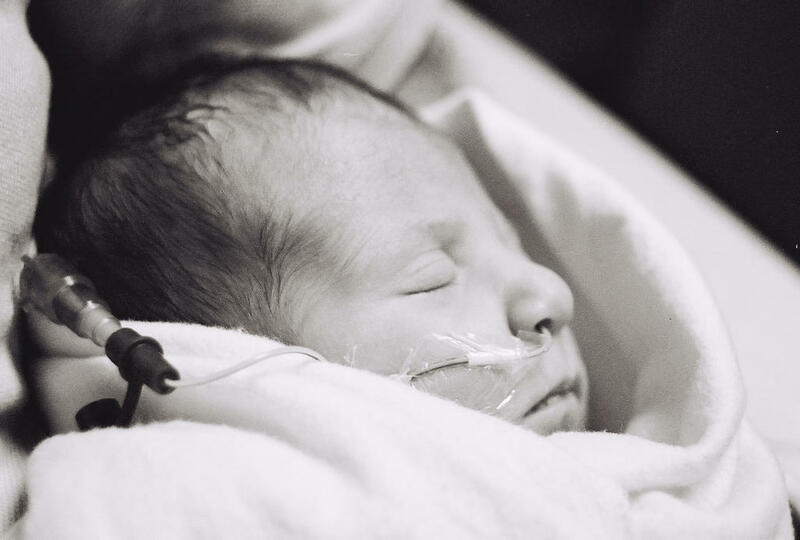 In the past 4 days, we’ve seen Charlotte improve enormously—her color is lovely baby bisque, her vitals have been steady and stable, and she tolerated a continual decrease in the ventilator breathing assist. The big update for the day—Charlotte passed all her respiratory challenges today and the ventilator tube was removed at 3 pm today! We knew it was likely, but we weren’t sure it would happen. When we walked in around 4:30, I gasped and poked at Philippe. He said, “What? !” and I pointed at the ventilator machine, lights off and pushed away from the bedside. We saw that before we saw our beautiful baby’s face, unpuckered, her little pink mouth pursed in a cry. Then we heard her little voice for the first time since the surgery. Yes, everyone, I cried. I cried to see her face, to hear her voice. It was such an incredible moment. Little Charlotte is doing great. We think she may be having some morphine withdrawal (pooping every 20 minutes is apparently a sign of that. Who knew?!). Other than that and a sore throat that seems to be bugging her, she seems to be doing well. She’s cute as a button, too. She was wide awake while we were there—she stared at us and held our fingers. Strong grip. The nurse said that she calmed down a lot when we got there. Poor little thing kept crying, almost falling asleep and then waking herself up. As we left for dinner, the attending doctor was ordering methadone and atavan to alleviate her little bit of distress and help wean her off the morphine. Or, as they say in the hospital, “to take the edge off.” I, of course, keep asking what they have to take the edge off for parents. Vodka tonic, please? On the chest tube front: To date, the tubes have drained nearly 200 ml of chylous effusion from her chest, most of it in the first day or two. Our understanding is that for as long as even the tiniest bit is draining, Charlotte will have the chest tubes. And, that’s just fine with us. 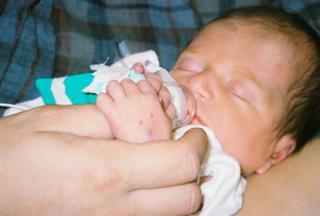 We want to be sure that every little bit of ick has been drained from her lungs and that it won’t start again. 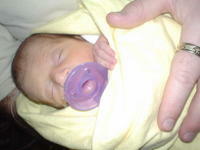 Chest tubes will keep her in the PICU, and now that she’s in a crib (did I mention that? 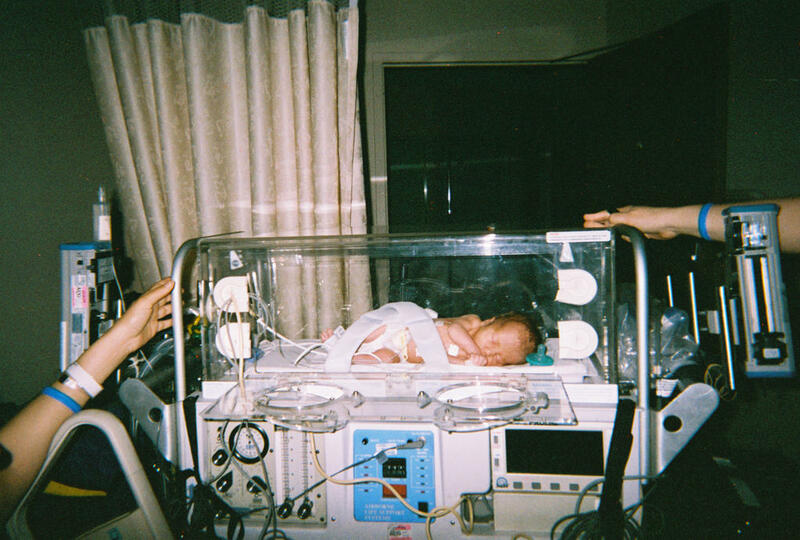 ), it’s hard for us to hold her with the tubes (because of the way they are wound through the crib), but these are small inconveniences if they mean that Charlotte will stay stable. Yesterday the doctors finally found what seems to be the root cause of Charlotte’s discomfort and backtracking. Sunday’s echocardiogram was inconclusive, so we had a repeat yesterday. The good news was that there was no cardiovascular reason for the backtrack. In essence, the repair looks good and is holding. They did notice, however, that Sprout’s pulmonary valve was regurgitating (leaking) more than it had been, a concerning turn of events. While the x-ray didn’t show any fluid around the lungs, the leaky valve indicated that pulmonary pressure might be affecting valve function, so an ultrasound was ordered. The ultrasound indicated that, indeed, a large amount of fluid had gathered around the lungs. This created high pressure in the lungs, probably accounted for her low oxygen saturation level, and may even have contributed to her bloated belly. There was enough fluid that the surgeons decided to re-insert bi-lateral chest tubes. As you can imagine, Philippe and I gasped at this. In the midst of what was, in our eyes, a crisis and major post-operative glitch, re-inserting the chest tubes seemed catastrophic. The tubes went back in around 5 pm yesterday. Immediately, nearly 70 ml of chyllous effusion oozed out. In the collection box it looked like a melted creamsicle. What is chyllous effusion? Basically (which is the only way I can explain it), it’s a fatty fluid that is the result of Charlotte’s lymph nodes processing fat badly, in the wrong direction (i.e., into her system rather than out of her system). This happens because the surgery necessatitatd cutting through lymph tissue and the tissue malfunctions until it heals. 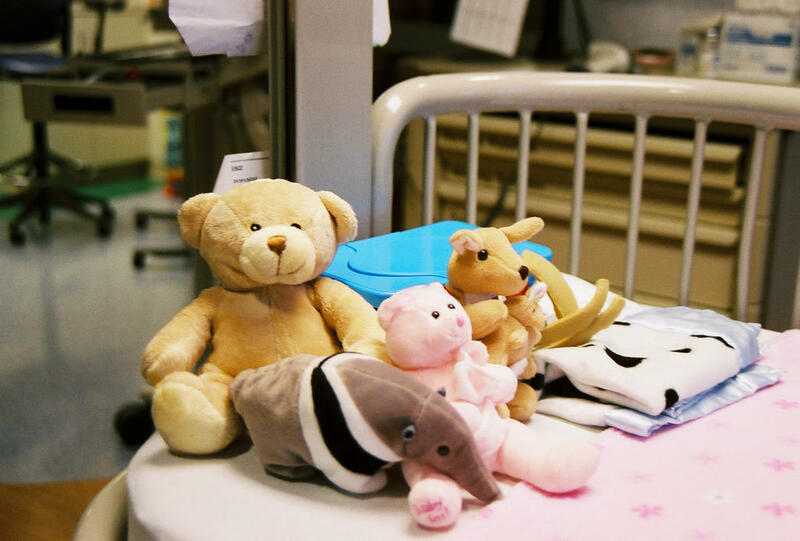 Dr. Stewart (the surgeon who re-inserted the tubes) told us that the question isn’t really why this happened to Charlotte, but why it doesn’t happen to all cardiac surgery patients. In 24 hours, more than 170 ml have drained and Charlotte is back at her birth weight. She looks soooooo much better and her stats are great. This complication means that she’ll be on the nasty ventilator for at least another week. We’re not sure how long the tubes will stay in, but they won’t come out quickly. And, Charlotte is officially on a fat-free diet for at least 6 weeks, or until the lymphs scar over. No breast milk—when she goes on formula it will be a fat free concoction (the name of which escapes me right now). So, I pump away (sorry if this is TMI). It is good to have a diagnosis and to see the measures taken work so quickly. Such a relief. But, it is a bit of a bummer to know that she’ll be in the ICU for at least another week. 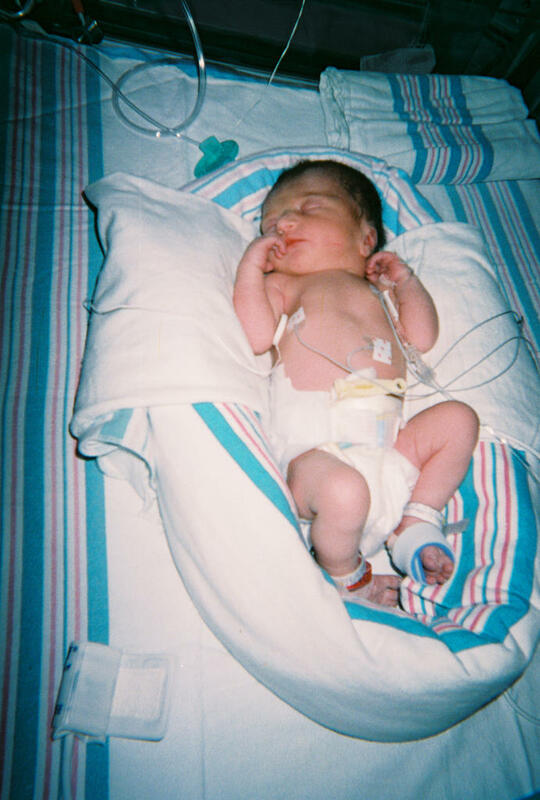 We just want to bring Sprout home and start having a normal baby-centric life, rather than a hospital-centric life. Sprout has arrived. 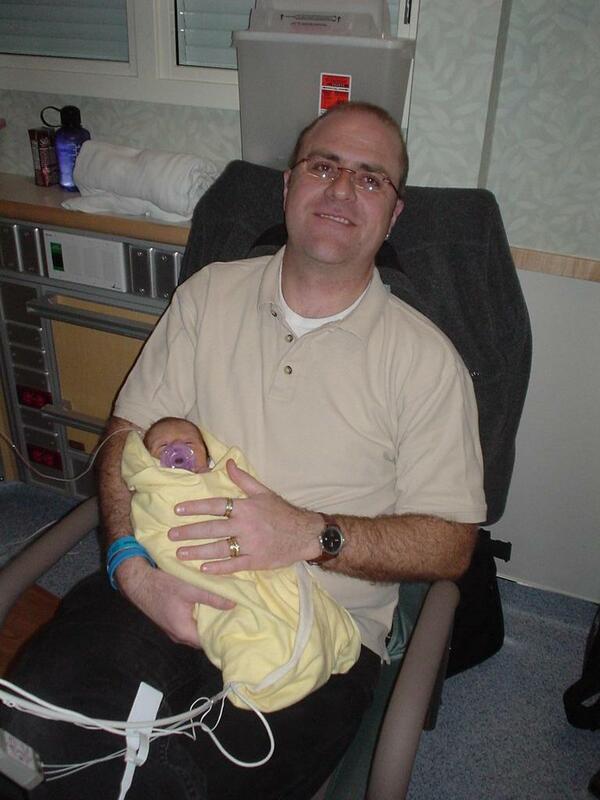 Charlotte Alice Geyskens was born on May 9, 2005 at 7:56 pm Chicago time. She was 4 weeks early, but weighed in at a healthy 5 lbs 2 oz and 43 cm long. It was quite an adventurous day and, as we say in marketing, an unexpected delight to meet our daughter a bit early. Charlotte is doing as well, if not better, than can be expected at this time. She’s happily settled in at Children’s Memorial Hospital (no visitors, flowers, balloons, etc. please) where the nurses love her and she’s getting oodles of attention. She’s been breathing on her own from the beginning; getting nutrition through the world’s tiniest NG tube, but otherwise only hooked to monitors; no IV or anything. Needless to say, she is adorable, gorgeous, and has a beautiful disposition. Philippe swears she’s already smiling at him. And for those of you who know Philippe’s theory on diaper-changing (he would never change anyone’s but his own child’s), Philippe is now an expert tiny diaper changer. Looks like I finally have competition for his attention.